Reggae Horseback Riding for two hours include a 4 mile trail on this historical private ranch which is one of the most beautiful 900 acre property in Jamaica. The trail is very informative about the Jamaican culture , herbs and spices used in the famous Jamaican Jerk sauce. Riding this nostalgic countryside, you will experience the many different flora and fauna of Jamaican landscape with our protected specie of Jamaican parrots frolicking above the trail on these 80 feet tall black olive trees, Awesome! This four mile trail eventually enters the most picturesque and surely Jamaica’s Longest Beach Ride of 1.6 kilometers of white sandy beach of private property! This magnificent mountain side view beach ride is majestic & very romantic! The fun of this tour is our famous Ride “N” Swim where we swim these Gentle REGGAE horses gliding along these waves in the warm caribbean ocean! Exciting & Just a thrill! fun! Fun! Fun! 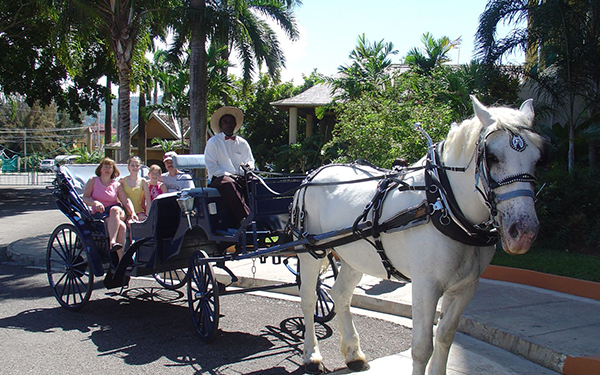 We provide the only Horse & Carriage tour in Jamaica! Wherever in Jamaica you are we can provide this service. There is an additional charge for transportation depending on your location on the island. Carriage and horses may need to be delivered by truck and set up.